Is this the beginning of the end for Lynch? Is this just a minor injury hiccup for Marshawn Lynch or are we seeing the beginning of the end? Back issues have dogged him throughout his career, but the Hawks have managed him well and he has not missed a game since 2011. Now he is dealing not only with that recurring issue but a hamstring injury that could keep him out Monday against Detroit. Carroll said Lynch’s “calf thing is resolving” and it’s all about the hamstring, which Lynch injured on his bobbling fourth-down catch at the end of the first half vs. the Chicago Bears. 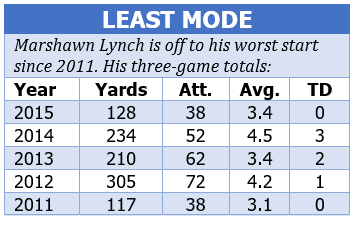 The Seahawks were lucky Lynch made it through last year without missing a game. He was in and out of the lineup in several games, including both contests against Arizona. In Kansas City, he stayed on the frosty field at halftime to have his back worked on. As always, the team treated him with kid gloves, milking every yard it could get out of him. This year, the 29-year-old power back is off to a rough start — with just 128 yards on 38 carries (3.4 average). Those are his worst three-game totals since 2011, when he ran for 117 yards on 38 carries (3.1 average) behind an even worse line than the Hawks have now. Lynch actually has been the only subpar producer in the running game this season. Russell Wilson leads the team with 137 yards and a 5.7 average, and Fred Jackson and Thomas Rawls both are over 5.0 yards per carry. Rawls, an undrafted rookie, busted out for 104 yards on 16 carries against the Bears. We wrote earlier this year that the Seahawks didn’t really need Lynch — they (and many fans) simply wanted him out of sentimentality. Rawls proved the point, running every bit as hard as Lynch typically does. According to ESPN Stats, he averaged 3.56 yards after contact — the second most by any NFL back this season. Rawls embodied Seattle’s power running philosophy almost as well as Lynch has for the past four years. Rawls could be what the Hawks hoped Christine Michael would become. Michael was a second-round pick in 2013 based on his speed, but he never figured out how to do all of the little things. Rawls is still learning protections and the passing game (he dropped a pass vs. the Bears), which is why Fred Jackson is the third-down back. 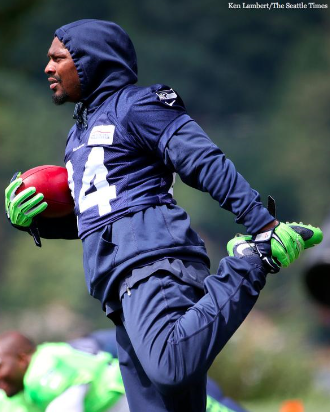 But the rookie is the closest approximation to Lynch running the ball that the Hawks have found. It remains to be seen whether Lynch comes back quickly from his nagging injuries or whether he is sidelined for a game or more. Either way, it is distinctly possible — if not probable — that the Seahawks will use more of a rotation this season, with Rawls and Jackson spelling Lynch more than has been done the past three years. If Lynch continues to battle injuries, it’s also quite possible that those retirement rumors of yesteryear will become fact next year. But, the emergence of Rawls — if only for one game — proves the Seahawks do not necessarily need Lynch. They just need someone who will run like him.